I received this book in exchange of an honest review so anything written below are the ones I’ve experienced while reading or the ones I’ve observed. 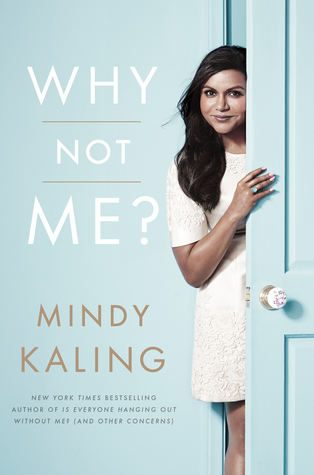 I’m giving this book a four (4) stars review because it is fun to read, it is inspiring and Mindy is simply a cool person. I was glad to know things about Mindy by reading this book, I honestly don’t know her before I was clueless and didn’t bother doing research not until I started reading the book. It was an honor to be able to know a part of her just by reading one of her works. The way she wrote this was for the reader to enjoy at the same time to inspire them (us). That’s how she is in real life maybe? I think meeting her in person would be awesome too. The book tells how much she’s been through from her entire celebrity life I could sense it was hard but still she managed to make everything enjoyable. I like how she sees life in her own way, it was like no matter what you throw at her she has a way to get out of the storm and comes back again. In some parts of the book I could also relate to her and also some parts I feel like I pity her. It was the way she narrates she was trying her best but no one wants her and I know exactly how that felt, that specific part of the book when she threw a party and she kept trying to invite everyone? It was… awkward and annoying at the same time. But all in all, I adore this woman. She’s full of positivity and inspiration, she makes all the people around her happy and with positive vibes. In her book she might be asking for love but on the positive side she’s diverting to something else just to overcome that side of her life. She may be picky or something? But I can’t blame her for that all I know is she’ll find the right man for her. She’s a strong woman after all. As a reader, I was inspired in her doings, some might sound crazy and I don’t know if she’s serious but others? She has a point. I like her advice to the graduates of a University also her advice to a child that asked her “Where do you get your confidence?” that was a question that is difficult to answer. I think Mindy is a kind of person who you will enjoy talking because she’s full of words and honest woman. She’ll say what she has to say no matter what that is and she’ll make sure you get to laugh when she’s around. Well, that’s how her book told me. The book itself is a self-help. People should read this if they want to have a different perspective or view in life. MINDY KALING is an Emmy-nominated writer and actress, and author of the bestseller Is Everyone Hanging Out Without Me? She is the creator and star of the Fox and Hulu sitcom The Mindy Project, and she formerly played Kelly Kapoor on NBC's The Office. You can find her on Twitter (@mindykaling), or at her desk pretending to be writing a screenplay but actually online shopping with a memorized credit card number. She resides in Los Angeles.